This article, first published in 2012, notes that “Although the United States has its own glorious history of hosting world’s fairs…we have had a spotty participation record in recent decades”. The author, Beatrice Camp, served as Consul General during the Shanghai Expo 2010 and later as Washington coordinator for the Milan Expo in 2015. After the Milan Expo, the State Department established an Expo Unit that is now overseeing U.S. participation in world’s fairs, including the next universal exposition planned for Dubai in 2020. Shanghai high school and university students were invited to the USA Pavilion to exchange ideas with student ambassadors and learn about studying in the U.S. Although the United States has its own glorious history of hosting world’s fairs going back to the Philadelphia Centennial Exposition in 1876, we have had a spotty participation record in recent decades. Where once such international expositions were seen as prime sites to show off our country’s achievements, today they hold little significance for the general American public. The reasons are many, including post-Cold War disinterest in cultural diplomacy and legislation prohibiting the use of appropriated funding for an American presence at world’s fairs unless expressly authorized by Congress. U.S. membership in the Bureau of International Expositions (BIE) ended in 2002 after Congress refused to provide funding for dues. With no world’s fair hosted in the United States since 1984, many Americans have little clue as to what such an event can offer to either host cities or participating nations. This set of circumstances creates huge obstacles for U.S. involvement in world’s fairs today. We dropped out of the 2000 exposition in Hannover, Germany, and barely made it to the 2005 fair in Aichi, Japan. Many thought that China’s invitation to build a U.S. pavilion at the 2010 Shanghai Expo was dead on arrival, even though the media and others predicted that a U.S. no-show at China’s big party wouldn’t go down well with the PRC government or public. Fortunately, however, the combination of Chinese pressure and the pull of public diplomacy (PD) opportunities proved too strong to ignore—Shanghai Expo 2010 was an expo of necessity for the United States. 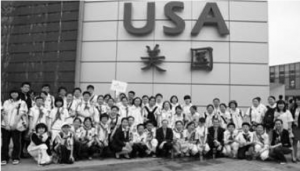 After navigating a series of difficult challenges, the USA Pavilion at the Shanghai Expo opened on May 1, 2010, to the first of over 7 million Chinese visitors, who stood in line for hours to experience a bit of America. While the pavilion itself was a public-private partnership, our U.S. Consulate in Shanghai played a key role in moving the effort forward and exploiting the people-to-people diplomacy prospects that the event offered. In response to China’s invitation, then-Secretary of State Condoleezza Rice signed a letter expressing U.S. interest and the Department’s Bureau of Educational and Cultural Affairs (ECA) followed up with a request for proposals in October 2006. In early 2008, ECA selected a group to plan, design, raise money for, operate, and manage a USA pavilion at the Expo. Journalists continued to question whether the authorized team would be able to raise the $60 million budgeted to build, equip, staff, manage, and dismantle the pavilion. If the money was not in the bank by a certain deadline, would the U.S. government be able to sign a participation contract with the Expo authorities? If the United States dropped out, what would happen to the prime real estate that had been saved for us near one of the main gates? Rumors circulated that a McDonald’s would go up on the site if the American group could not mount a pavilion there. While the Chinese media was consistently positive about the American effort, Western media focused on the potential negative consequences if the United States snubbed China by failing to take part. This story line was too juicy to ignore, with our only recourse continued expressions of confidence that the money would be raised and the pavilion built. The Western media quickly lost interest once our success was certain; one American reporter told me that his editor did not think readers would be interested in any stories about the Expo or the USA Pavilion in the absence of controversy. Other problems arose. The late start led to missed opportunities, while the corporate signage in the entrance area drew criticism from Americans who thought it was inappropriate for a national pavilion. In contrast, Chinese visitors were generally impressed by the corporate involvement; President Hu Jintao admired the sponsor wall during his visit to the pavilion. In addition, consulate and other Foreign Service officers had to tread carefully among the restrictions regarding fundraising and the use of appropriated funds; several of us were also the targets of online attacks by a small group of critics who seemed determined to see the project fail. Even as we pressed forward, it was clear that the cumbersome process and late start required compromises in design and execution. I agreed with those who thought that the pavilion was too reliant on videos, even though I found the main show, a 4-D film titled The Garden, charming and effective. Several Chinese officials pointed to the lack of any pièce de résistance highlighting high technology, which is what many expected from a U.S. exhibit. Some Americans complained about insufficient attention being devoted to democracy, or education, or tourism promotion, issues that we were able to address in our programs during the course of the Expo. Those of us working at the consulate in Shanghai were frustrated by the slow hiring pace for the pavilion, which left our public affairs office fielding issues that should have been handled by private sector pavilion staff. We pushed for the early stand-up of a communications team that could explain the process and defuse the criticism. Despite all these issues, we created a successful public–private partnership that presented public diplomacy on a massive scale and proved a bright spot in an otherwise testy year for U.S.–China relations. Ironically, some of our counterparts at other national pavilions told us they envied the ability of the USA Pavilion to raise private funds and work with private developers, rather than depend on a government bureaucracy. A number of countries reached out to pavilion and consulate staff to learn more about our public–private model both during and after the Expo. We shared our process, warts and all. We raised over $60 million and built an entire organization and pavilion in roughly ten months, copied previous exhibition best practices such as the Student Ambassador Program, and took advantage of traditional PD tools such as performing arts and alumni programs. The Public Affairs Sections in Beijing and Shanghai provided continuous support throughout a long and ultimately successful effort that reached 7.3 million visitors directly and hundreds of millions more through media, social networking, and a virtual pavilion site. 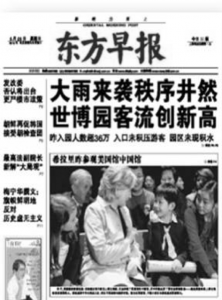 Secretary Clinton’s May 2010 visit to the USA Pavilion in Shanghai was front page news. Former Secretary of State Madeleine Albright led a presidential delegation for our National Day celebration, which also featured entertainer Harry Connick Jr. and the University of Southern California Marching Band. Other American performers who took the stage at Expo ranged from Herbie Hancock and Dee Dee Bridgewater to Ozomatli, Hawaiian hula dancers, a Texas cattle-roper, the U.S. Army’s 25th Infantry Division marching band, the Chicago Bulls mascot, NBA stars, and Sesame Street’s Elmo. Our 160 Mandarin-speaking U.S. student ambassadors represented 38 states and 84 universities. Their ability to welcome the crowds in fluent Mandarin (as well as Shanghainese and Cantonese) became one of the hallmarks of the USA Pavilion. With their youth and language skills, the student ambassadors joked with the crowds and encouraged audience response in a very American way; this was people-to-people diplomacy at its best. We were also proud that many of these young Americans took the Foreign Service exam at the consulate while in Shanghai; already a number are headed for careers dealing with U.S.–China issues. The student ambassadors met American VIP and government visitors as well, gaining career experience while the VIPs appreciated the hometown touch. When Chicago Mayor Richard Daley dedicated a statue by a Chicago artist on the Expo grounds, he did not miss the opportunity to take photos with students hailing from his city, all wearing Chicago t-shirts. In addition, the pavilion and consulate staff organized more than one thousand cultural and entertainment programs featuring 150 different American groups, including four Grammy winners. The pavilion promoted American businesses and brands with 68 official sponsors and 16 official suppliers. Our presence generated more than 8,000 media stories in China, the United States and other nations. By going carbon-neutral, the pavilion helped live up to the environmental theme of the Expo. The pavilion also promoted interest in study in the United States: the University of Southern California reported in fall 2011 that applications from China had increased eightfold. While some visitors and officials said they expected more technology on display, the main 4-D movie made a deep impression on most Chinese visitors, who appreciated the message of teamwork, citizen involvement, and environmental awareness. The story told by The Garden was simple and compelling, showing a little girl who mobilized her community to turn an ugly vacant lot into a beautiful community garden. The movie’s display of optimism, community spirit, and perseverance offered a metaphor both for the challenges of creating the pavilion and for the international community working together to achieve common goals and a better world. After the Expo, our public affairs office continued to distribute DVD copies of The Garden video. It remains available on Youku.com, one of China’s largest online video sites, allowing millions more to experience the main themes of the USA Pavilion. We even sent copies to Kabul at the request of the wife of then-Ambassador to Afghanistan Karl Eikenberry, who was moved by the self-help, civil society message of the movie when she toured the pavilion with Afghan contacts. In the end, the Shanghai Expo drew over 73 million visitors during May 1 through October 31, 2010. A record 189 countries participated in the Expo, along with 60 cities, corporations, and groups. American people-to-people diplomacy reached the biggest audiences I have seen in my career. Videos, exhibits, cultural programs, and American student guides at the pavilion offered 7.3 million visitors a face-to-face encounter with the United States. (The Smithsonian’s popular National Air and Space Museum receives 7 million visitors a year, twice the period of the Expo.) For many millions of Chinese citizens, this was their first time to meet an American in person, an opportunity most of them would never have had if the United States had not joined in the Shanghai Expo 2010. As a career foreign service officer, Beatrice Camp was the first woman and the first public diplomacy officer to lead a U.S. Consulate in China. She also twice managed U.S. participation in world’s fairs – Shanghai Expo 2010 and Milan Expo 2015 — and served as Senior Advisor at the Smithsonian. Now retired from the foreign service, she is editor of American Diplomacy, an online journal.